How to Do Keyword Research: A 6-Point Checklist was originally published on BruceClay.com, home of expert search engine optimization tips. Open a landing page on your website. Describe what it offers in three to five words. If you are able to think of not one, but several dozen different three- to five-word combinations that work equally well to describe your landing page and are not sure which one is the best choice, you’re not alone. Words have synonyms. “How do I…” and “How to…” are painfully similar. How do you choose whether to call it “Backpacking Europe,” “How to Backpack in Europe,” or “European Backpacking Tips” when all three describe your landing page equally well? How do you know which one will resonate best with your target market and land the SERP position, traffic, and conversions you’re after? The goal of this article is to make keyword research easy and accessible. There are lots of articles that dive deep into using Google tools for keyword research, and advanced keyword research techniques — this is not one of them. Big picture, the idea is to have extremely targeted keyword phrases that have a high search volume and low competition mix. In the most basic terms, this means — in a perfect world — your keyword phrases describes your content accurately, a lot of people are searching for the exact phrase, and there aren’t a lot of authoritative competitors who are also optimizing for that exact phrase. Most keyword research starts with a long list of hunches. Optimizers (even if it’s Joe from the mailroom doing your keyword research, once he starts working on SEO he technically becomes an “optimizer”) compile a list of words and phrases that they think their target demographic would use to describe their content, products, and services. Sometimes these lists are based on persona research, but most of the time these lists are compiled of phrases pulled out of thin air and largely represent the words the company hopes people use to describe their products and content, not the actual words the demographic is using. Start your keyword research process with one of these lists. Don’t set any limitations at this point. Think about how your consumers would ask for your products, services, and content in search queries. What kind of stems, like “How to” or “Where can I,” are appropriate? What about local modifiers like “Los Angeles County” or “Ventura, CA”? Or modifiers like “free”? What works best to describe your content? In your keyword research process you’re going to analyze your brainstorm list of theoretical keyword phrases to determine which have the right mix of demand, attainability, and relevance to earn top SERP results. Since this post is about the data you pull from keyword research tools, not the tools themselves, I am going to keep this section high-level but I did want to make it clear that, unless you are a mind reader, you are going to need to use a keyword research tool to mine keyword data. Everything covered in this article you can do at a basic level with Google.com and the Google AdWords Keyword Tool. Paid tools like WordTracker and the Bruce Clay, Inc. SEOToolSet® offer more advanced keyword insights like in-depth competitive analysis, and search insights for the Bing and Yahoo! engines, as well as Google. If you’re hungry for more information about tool possibilities now, check out our live blogging session from SMX Advanced: Advanced Keyword Research Tools. While physically you can enter the words from your brainstorm list into your keyword tool one at a time or all at once, I recommend entering your words in small batches of 10-12 related phrases as it will make parsing through related keyword phrases (called “Keyword Ideas” in the AdWords Keyword Tool) much easier. When using the AdWords Keyword Tool it’s important that you are searching for “Exact” keyword matches, and not “Broad” keyword matches. With “Exact” selected, the tool will tell you how many people searched for your exact phrase as you entered it, and then in the section below (Keyword Ideas) it will return a list of related search queries that are close to the phrases you entered. Use these suggested phrases to add new ideas to your keyword brainstorm list, or to parse out not-so-great-in-hindsight ideas. Nearly every keyword research tool will return suggested keyword phrases that are similar to your original phrase request. As mentioned, in the AdWords Keyword Tool these are called Keyword Ideas. Gleaning insights from suggested keywords is truly invaluable as it allows you to understand the exact language your target demographic is using to search for your products. This information can help you build and refine your target keyword list, as well as your product and content roadmaps (read more about why SEOs use keyword phrases, including why they help marketers develop content and product strategies). Pillar Four: Do the Keywords Accurately Describe the Content? When you start looking at keyword suggestions it can be easy to fall into a high-volume drunken haze and forget that relevance means directly descriptive of your content or product — not loosely related to the idea of the content or the general needs of the target demographic. Don’t approach your keyword like the Six Degrees of Kevin Bacon. If you identify a keyword phrase that doesn’t describe the topic on your landing page, but is related to your topic, or of related interest to your target demographic, create a new landing page with new content to work in that keyword phrase. Don’t try to fool humans or Google spiders by using phrases that do not exactly describe your content — use keyword research to inform content strategy! Think to yourself: When the user searches this query, what are they looking for? What do they want? If they find my site, will their needs be met? Pillar Five: Volume — How Many People Ask For It Like This? Looking at the Search Volume of a keyword phrase will tell you how many times per month an exact keyword phrase was entered into a Google search. Some tools like the AdWords Keyword Tool will only tell you how many times the term was searched in Google; other tools like the SEOToolSet® will tell you how many times the term was searched in Google, Yahoo! and Bing. When an exact keyword phrase has a high search volume it tells us two things. One, that there is a high consumer demand for this product or for information on this topic, and two, that right now — this month — this is the exact language that many people are using to try to find more information about the products and services you carry. Identifying high volume search terms means identifying demand and pinpointing language trends. Optimize your page with the exact words the searcher uses and Google, recognizing your content as an extremely relevant choice, will consider you a contender for the SERP top three. 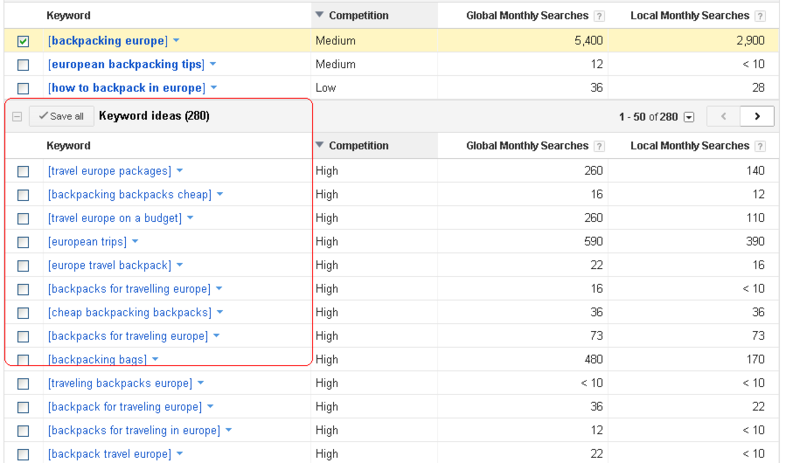 Look at the Local Monthly Searches column in the AdWords Keyword Tool. There is not a catch-all magic number that represents the perfect search volume. What constitutes the “right” search volume is going to be different from brand to brand, and objective to objective. 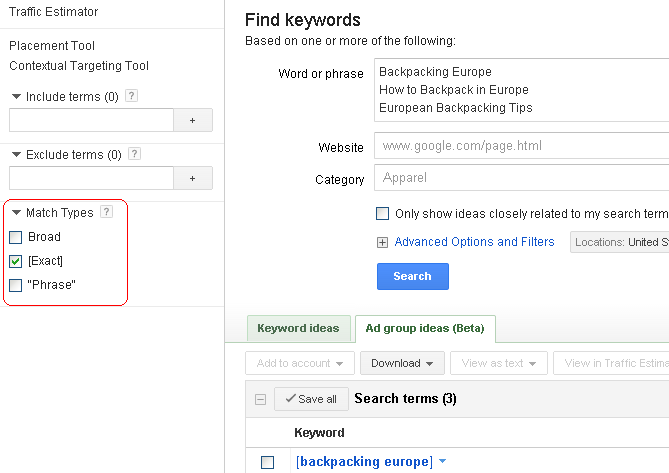 Although really specific long-tail keywords like “how to backpack in Europe” are going to have less search volume than broad keywords like “backpacking,” specific phrases that target exact need are significantly more likely to convert. I’d rather drive 100 qualified leads who spend time on my site and buy products than 10,000 clicks that immediately bounce (leave the site quickly without clicking any other content). That said, whenever possible try to use the Keyword Ideas section to find words that are the best of both worlds — very specific long-tail keyword phrases with high search volume. For instance, in the example to the right we’d want to use “Backpacking Europe” — a phrase with 2,900 local searches — rather than the very similar phrase “How to Backpack in Europe,” which only has 29 local monthly searches. Pillar Six: Competitive Analysis — Does This Mean What I Think It Means? Pillar six is all about looking at what your competitors are doing and analyzing what the competition for the keyword SERP space looks like. To get an idea of a keyword’s competitive space do a search for the phrase you’re trying to rank for. Just enter the phrase into Google as if you were the searcher. Do you see results that offer products and services similar to yours? Do you see highly competitive big brands in the top ten? Do you see ten results that have nothing to do with your content? That’s good! That means you’re in the right space. Now look at who else is ranking for your keyword phrase. Who are your competitors for the top ten, or top three? What are they doing? What language are they using? One key to beating your competitors in the SERPs is doing more things right than them, so take some time to think about what the website in the spot you want is doing well and what they’re neglecting. Do they have the keyword phrase in their Title, Description, and body copy? Sometimes you have to click on all ten links to get a 360-degree idea of where you stand. To get an even more detailed view of how competitive your keyword phrase is do a Google search for “Allintitle:keyword” where keyword is your keyword phrase. This will tell you how many web pages include this exact phrase in their Title tag, which will give you an idea of how many other web pages are optimizing for that exact phrase. Do you see highly authoritative big brands in the top ten? I know your mother always told you to never give up, but…sometimes you have to know when to fold ’em if the competition for a keyword phrase is just too steep. The number of clicks-throughs you’re going to see actively decays with every position you move away from spot number one, so if you have a slim to none chance of beating Adobe, Wacom, and Microsoft for spots one, two, and three I would recommend you spend your time targeting a different keyword phrase that you have a chance to rank highly for. You will have see more traffic and conversions ranking number one for a keyword phrase that has 1,500 monthly searches, than being in spot 15 for a keyword phrase that has 10,000 monthly searches. Sometimes keyword phrases can mean two totally different things depending on who you ask. If you perform a search for your keyword phrase and see returned results that have nothing to do with your content, or what you thought the keyword phrase was asking for, then you have uncovered a keyword phrase with two meanings. These situations are something hard to imagine, so here is an example. Say you’re optimizing for a page that teaches people how to use Ableton Live to create custom drum beats. 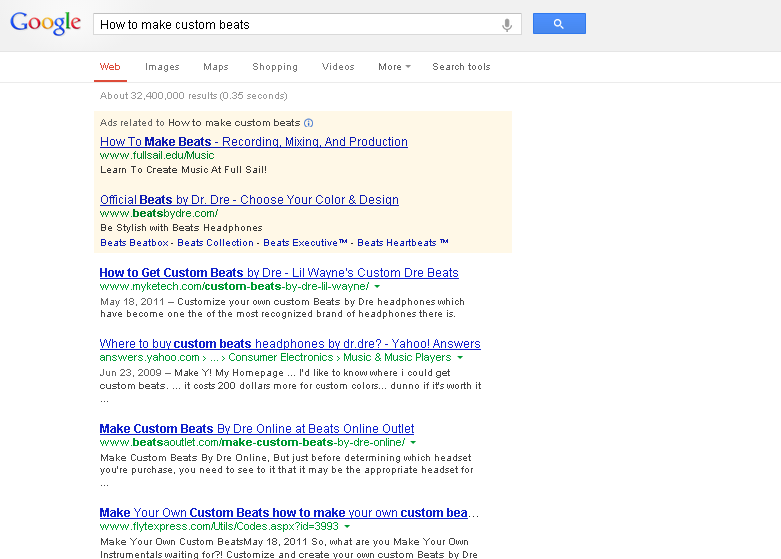 When you search for your keyword phrase “how to create custom beats” — a long-tail keyword phrase that is, in theory, extremely relevant to your page content — you expect to see tutorials that show people how to make custom drum beats with music editing software. What you actually see is ten links that show people how to make custom Dr. Dre Beats headphones. In the end the person who is looking for your content — how to create custom drum beats — is going to see these same results, be just as disappointed as you, and refine their search. Which means no traffic for you and wasted optimization effort. In order to drive traffic your web pages need to compete for page one rank in the SERPs. And in order to compete for page-one rank, every one of your pages needs to have keyword-rich Meta Titles, Descriptions, and body content. If you’re going to invest all the time to use target phrases in your optimization efforts, why not spend just a little more time to make sure you’re using the right language? Optimizing based on a hunch is not optimizing. Data is your friend.